An interesting celestial event is happening right now. If you look west just after sunset, you should notice a bright 'star'. This is actually the planet Venus. Once you found Venus, look at the right side of Venus. You may see a yellowish 'star", which appear much dimmer than Venus. If you succeed, congratulation! You have found Saturn, the ringed planet. Now, try looking above Venus. Try to see a dim red 'star'. If you fail, don't worry. Try again the next day as you may need a clear sky to do this. Again, if you can see this red 'star', congratulation! This is planet Mars. On the night of August 12th, 2010, the planets will be joined by 3 day old Moon. Now for extra challenge. Try your luck hunting down Mercury. Mercury is rather elusive. It never strays to far from the Sun and it is relatively dim. You will need clear sky or sheer luck to see this planet. To locate Mercury, the best chance will be on the evening of August 12th. Look to the lower right of the Moon.Mercury will be about 14 degrees to the right of the Moon and 5 degrees lower. Here is a method how you can measure angle in the sky. It is not unusual to have this kind of planetary gathering know as conjunction. 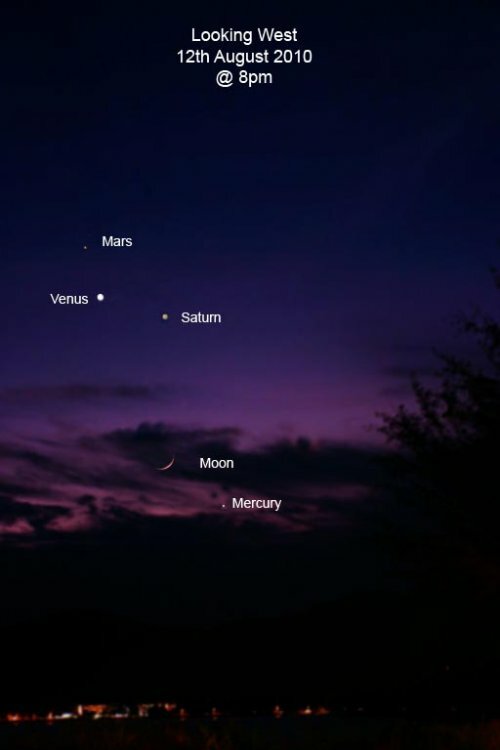 However, it is not too often we have these chance to see planets gathering close to each other in the sky. You can try imaging this event using your digital camera. It is not difficult. Use a tripod and try various setting on your camera to get best result. If you have nice photos, do share at my Penang Astronomy Facebook.